Habitat: Habitats include areas adjacent to flower gardens, areas along roadside ditches, cropland, and fallow fields. This species is occasionally cultivated in flower gardens because of the moderately attractive flowers. It prefers disturbed areas. Growth habit: 2-5 ft tall. Leaves: Alternate leaves are up to 8″ long and 4″ across (excluding the petioles). They are ovate-cordate and sparsely pubescent. Their margins are shallowly lobed, bluntly dentate, or undulate. Stem: Five angled (pentagon) hollow stem, spreading branches. 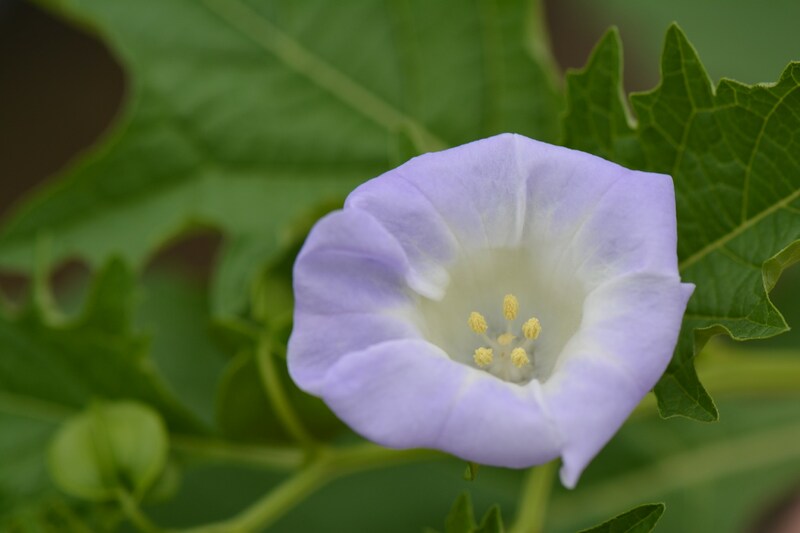 Flower: Trumpet-shaped lavender flowers that may occasionally be white, 5 cm or more across, and are produced from July to September. Similar Plants: The foliage of the Apple of Peru, or Shoofly, plant resembles an oversized Ground Cherry, but its flowers are quite different. 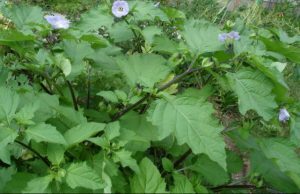 The Problem is……………Apple of Peru germinates continuously (spring, summer, and fall) in agricultural fields if moisture is available. 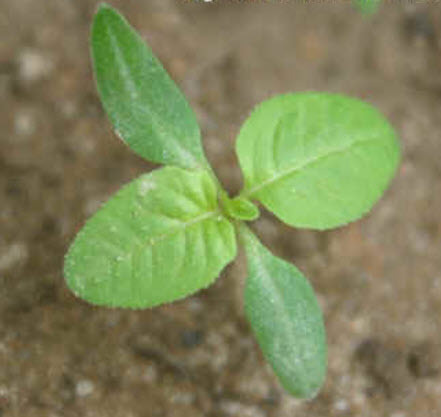 It has low sensitivity to most commonly used herbicides. 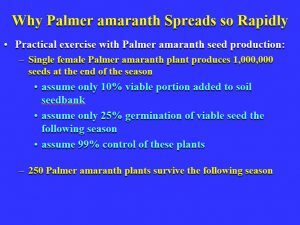 Poor control results in heavy infestations because it is a prolific seed producer. Large, persistent seed banks quickly accumulate in the soil due to seed dormancy. Very competitive with soybean and vegetable crops. Also confirmed alternative host for cucumber mosaic virus. Grapevines: when growing in groups of one hundred or more and not pruned, sprayed,cultivated, or otherwise maintained for two consecutive years. Following a summer of many instances of off-target movement of dicamba across the country from use in Xtend soybeans, the labels for Engenia, XtendiMax, and FeXapan were modified in an attempt to reduce future problems. 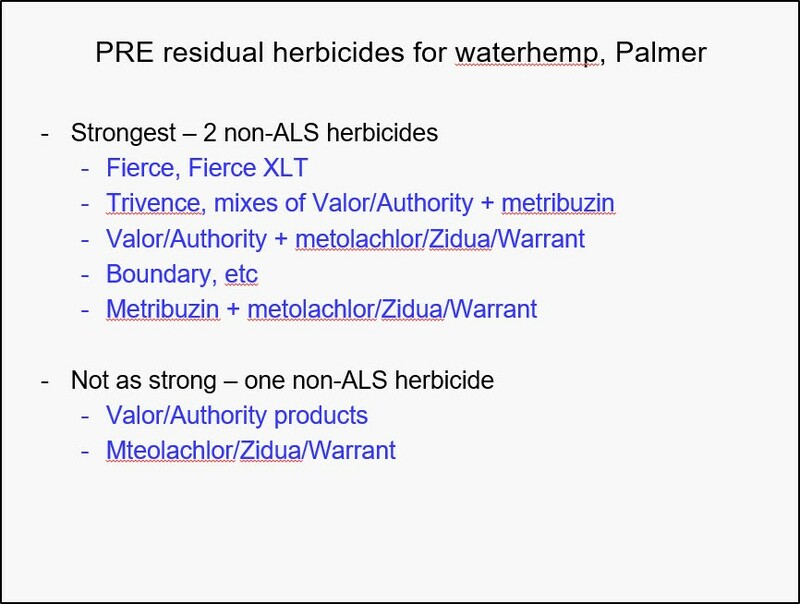 These products became restricted use pesticides, and an additional requirement is that anyone applying these products must attend annual dicamba or group 4 herbicide-specific training, and have proof that they did so. 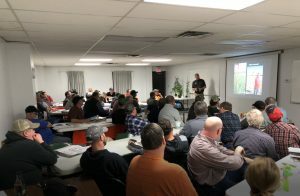 Central Ohio Farmers CO-OP will host a Dicamba training on Tuesday March 6 @ 6 p.m.
Dr. Mark Loux discusses Palmer Amaranth identification, control and management strategies at Monday night’s Agronomy School. 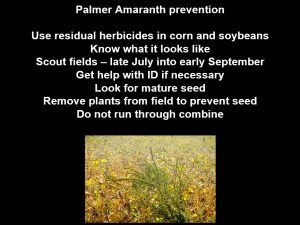 We now have Palmer Amaranth in Knox County … Our focus now shifts from preventing infestations to managing/preventing the spread of this invasive weed. 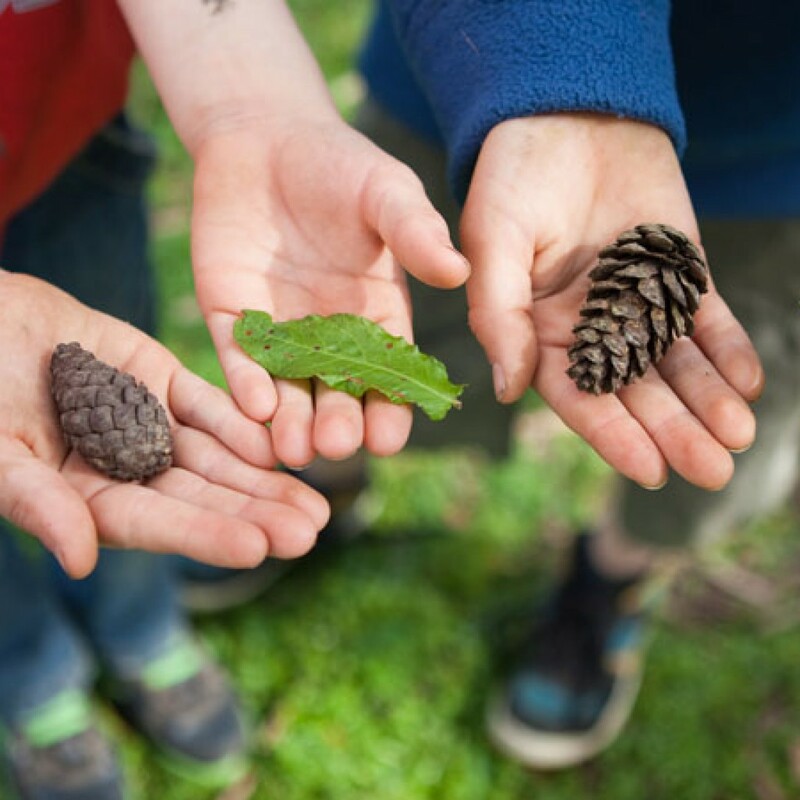 Gather the kids and join the Knox County OSU Extension and Knox County Park District Ohio Certified Volunteer Naturalists, Jean and Tim Tahyi as they lead hands-on activities teaching kids about mammals, reptiles, trees, birds and other things that might be found in the woods. The program is for children ages 5 and up, being held at the Centerburg Public Library from 1pm-2pm This program will begin March 3 and will occur the first Saturday in March, April and May. 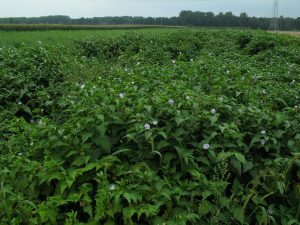 Soils and crops consultant of the Noble Research Institute, Eddie Funderburg, explains that cool-season weeds, or those that emerge in the fall and grow throughout the winter and spring, are finding their way into warm-season pastures. Funderburg explains this growing problem and highlighted some of the main culprits in a recent Noble Research Institute News and Viewsnewsletter. “Ryegrass can be a valuable forage or a difficult weed, depending on your situation,” Funderburg began. Commonly seen as a weed in summer forages, ryegrass hinders producers in two ways. The first is hay quality for horses. Funderburg noted that hay producers can struggle selling their first and second cuttings containing ryegrass as high-quality horse hay. 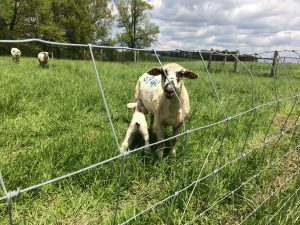 In pastures, where cattle consumption does not keep up with ryegrass growth, the species becomes extremely competitive with warm-season grasses in late spring. When it dies, ryegrass forms a mat that shades the ground, further inhibiting the growth of summer grasses such as bermudagrass. 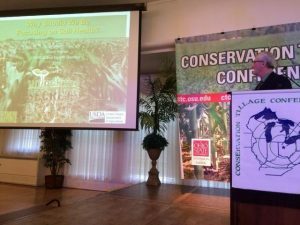 “I’ve seen quite a few stands of bermudagrass lost to excessive ryegrass competition,” Funderburg said. For effective control of annual ryegrass, Funderburg recommended spraying a nonselective herbicide in the dormant season. 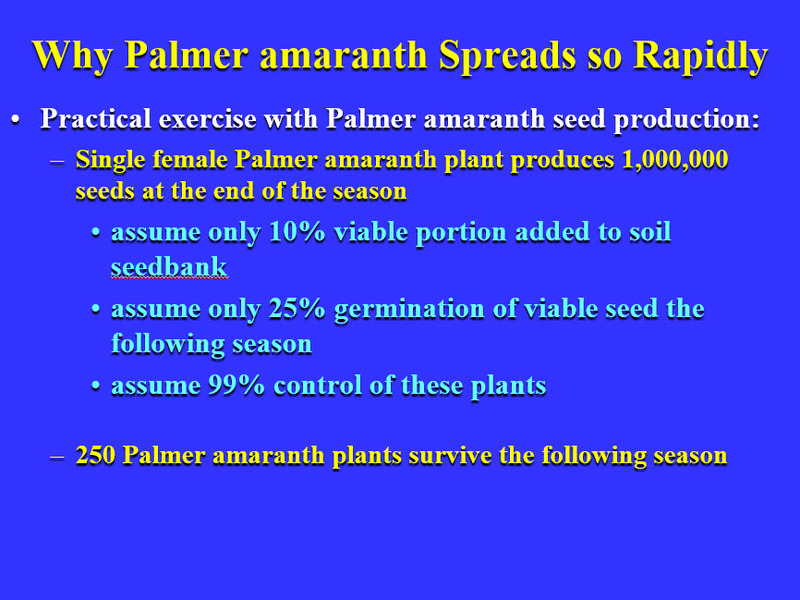 He warned that this treatment is not ideal if plants like cool-season legumes are actively growing at that time. 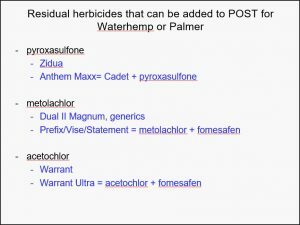 Glyphosate, the active ingredient in Roundup, is frequently used when desirable plants are inactive because it will kill only green plants upon application. Funderburg added that in some regions, ryegrass has become resistant to glyphosate. 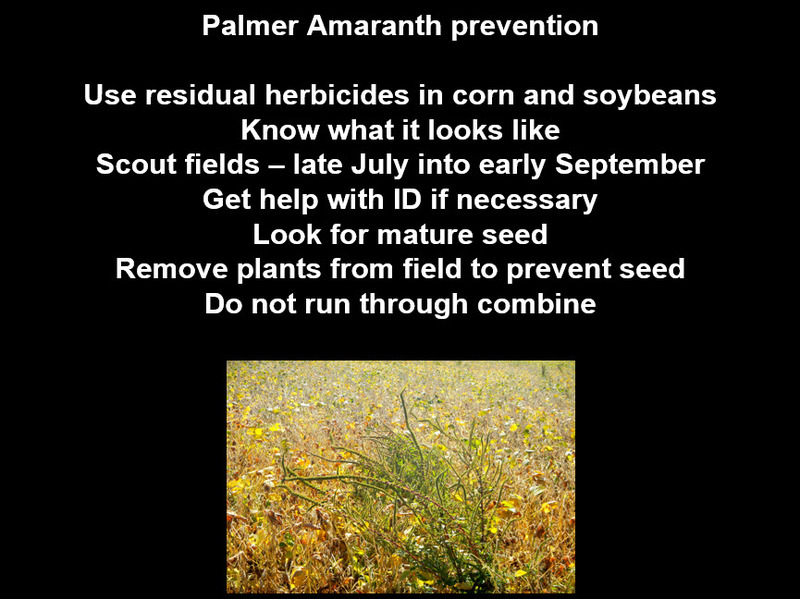 Where this is the case, paraquat can be used as a substitute. Thistles are a persistent problem in pasture management. This invasive species is best fought during the winter or early spring in order to see effective control results. Both treatments discussed above are effective in the rosette stage (lying flat on the ground), Funderburg noted. Once thistles begin to bolt and shoot a seedhead, they are much harder to control. 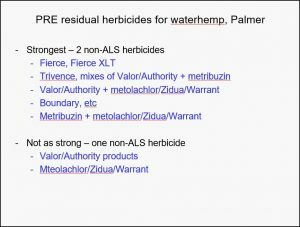 Before thistles bolt, broadleaf herbicides are more effective. Funderburg listed 2,4-D alone, 2,4-D with picloram, dicamba or aminopyralid, metsulfuron methyl, or a combination of metsulfuron methyl, 2,4-D, and dicamba as potential chemical control options. “Henbit is a plant that was not generally considered a pasture weed in the Southern Great Plains until the past few years, but now it can be a major competitor with bermudagrass in the early spring,” Funderburg said. Although 2,4-D alone may not eradicate henbit, it can easily be taken care of with other herbicides when sprayed early. 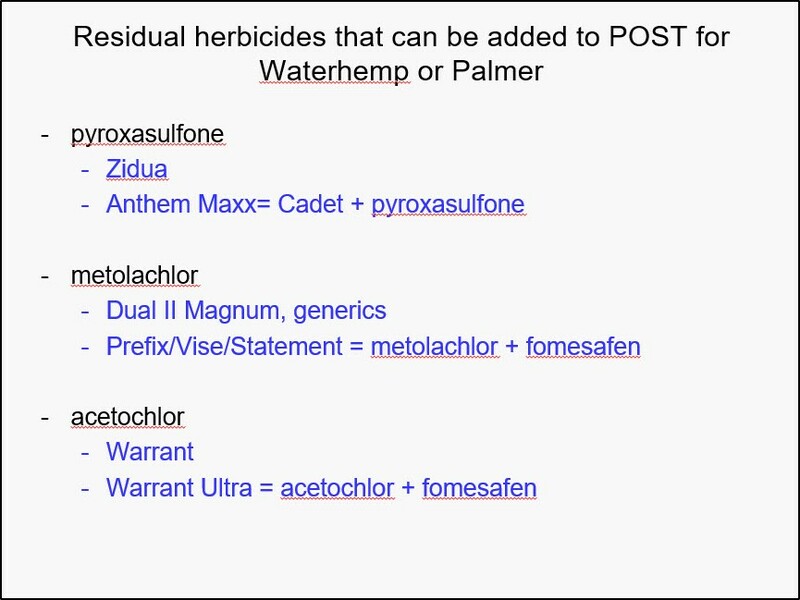 Funderburg recommended glyphosate in the dormant season, a mixture of 2,4-D and glyphosate, or mixtures of 2,4-D, dicamba, picloram, aminopyralid, and metsulfuron. For best results, spray when the henbit is still small. Winter weeds aren’t always a bad thing. Warm-season pastures and hayfields simply need to be scouted to determine if control is necessary. Funderburg said that in most cases control of winter weeds requires an additional application in order to also control summer weeds. An exception to this is aminopyralid (sold as Milestone or formulated with 2,4-D and sold as GrazonNext HL). Research shows that if applied in February, aminopyralid gives season-long protection against western ragweed, Funderburg added. The weather conditions thus far this winter have been tough for producers choosing to start their calving season earlier in the calendar year. Environmental extremes can add to the stress of a newborn calf entering into the world. Fortunately, Mother Nature has equipped the mother of the calf with a gift that helps the newborn to get off to a positive start. This gift is free of charge and commonly known as colostrum. Colostrum is often described as the “first milk” of the beef female. This is actually a misnomer as colostrum is physiologically much more similar to blood than milk. Colostrum contains very high levels of immunoglobulins (IgG) that helps to prevent infections as well as high levels of fat, energy, vitamins A and D, and white blood cells. It has very profound effect on the health and future performance of any calf. Under ideal circumstances, a calf will be born unassisted, get to its feet relatively quickly, and it is able to nurse its dam in two hours or less. Unfortunately, this is not always the case due to a variety of factors. 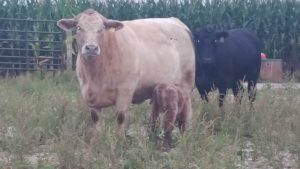 Calving difficulties, a weak calf, the cow will not let the calf nurse, a poor udder structure that makes it difficult to for the calf to nurse for the first time, etc. can delay the consumption of colostrum by the calf. It is very important that newborn calves receive adequate levels of colostrum as quickly as possible. Research has shown that the first 6 – 12 hours is a critical timeframe to make sure the calf receives enough colostrum. The calf should receive 2 quarts of colostrum by six hours of age and an additional two quarts by twelve hours of age. The absorption of antibodies becomes very inefficient by the time the calf is 24 hours old. If the calf cannot nurse its dam for whatever reason, the producer should supply colostrum directly to the calf. While nursing the dam is the preferred option, the next best option is to attempt to get the calf to nurse a bottle. If the bottle option does not work, then the producer must utilize the tube feeding option. Consideration should be given to the source of the colostrum. The best option by far is to provide colostrum from the calf’s own mother. If the mother has produced little or no colostrum, the producer should have alternative plans in place to provide a substitute source of colostrum. Fresh colostrum from another cow in your herd is the next best option but finding a cow with extra colostrum that has calved within a few hours of the calf in need will be difficult. Frozen colostrum from another cow in the herd is another potential source. Colostrum can be frozen and stored up to one year. It must be warmed up slowly to avoid the excessive loss of antibodies. Some producers have secured colostrum from outside herd but use caution with this approach as infectious diseases can be introduced to the calves through unpasteurized product. Keep in mind that not all colostrum is created equal. Research has shown that colostrum from beef cows is a lot more concentrated with higher levels of antibodies per liter, which typically results in the beef calf needing a lower volume of colostrum than dairy calves. Dairy cows typically give such a high volume of colostrum that the antibodies are more diluted compared to colostrum from beef cows. Colostrum replacers are good to have on hand in case of emergencies. These powdered mixes typically have 100 -125 grams of IgG per dose. Replacers are typically more expensive than colostrum supplements that have lower levels of antibodies. Supplements should be used in cases when it is questionable whether a calf has consumed a full dose of colostrum. In times of stress at calving, it is imperative that the new calf gets an appropriate level of colostrum in a timely fashion. A little extra time and effort from the producer can help insure that the calf gets off to a healthy start. In the summer of 2014, in Berks County, Pennsylvania, a keen-eyed state Game Commission officer spotted an unusual insect congregating in an ailanthus tree. It was a large plant hopper, about an inch long, with distinctive spots and red hind wings. The officer followed his training and called it in. “He gave us a chance,” says Sven-Erik Spichiger, entomology program manager for the Pennsylvania Department of Agriculture. It was a spotted lanternfly (Lycorma delicatula), a sap-sucking insect native to Asia. Just more than a month after this first report, Pennsylvania issued a quarantine in select counties in an attempt to restrict the spotted lanternfly’s movement. “From our perspective, this pest is quite frankly terrible,” says Spichiger. The U.S. Department of Agriculture agrees. In February 2018, it announced it was committing $17.5 million in emergency funding to stop the spread of the spotted lanternfly in southeastern Pennsylvania. This was after spotted lanternflies were reported in New York and Delaware in the fall of 2017 as well as Virginia in January of 2018. The new funding will allow the USDA’s Animal and Plant Health Inspection Service (APHIS), in cooperation with the Pennsylvania Department of Agriculture, to expand surveillance and control programs in an effort to stop the spread of spotted lanternfly and reduce its population in the core infested areas in Pennsylvania. Like other leafhoppers, the lanternfly feeds on plant sap, which damages the plant, but greater harm comes as a result of the honeydew that the insect excretes in abundance. 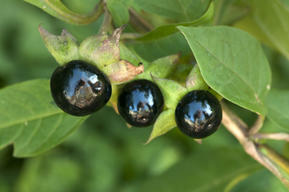 This sweet, sticky fluid promotes the growth of sooty mold, which is extremely damaging to fruit crops. Thankfully, effective control measures exist for the spotted lanternfly, but most alarming about the pest is its potential as a hitchhiker. Adult lanternflies can fly, but it may be the least mobile of their life history stages—their egg masses—that has the greatest potential for long-distance travel. Spotted lanternfly egg masses are inconspicuous, and females will lay them on virtually any surface: trees, lumber, yard furniture, vehicles. Combine that with the fact that their preferred host plant, ailanthus, is an invasive itself that tends to grow in disturbed areas such as around parking lots or along highways and railroad tracks. Ailanthus is already growing in 44 states. Female Spotted lanternflies that are ready to lay eggs tend to be lazy, dropping onto the nearest convenient surface and depositing roughly 30 to 50 eggs. Spichiger envisions a coal car stopped on an ailanthus-lined railroad track or an out-of-town pickup truck parked next to an ailanthus at a football stadium. A gravid female lanternfly drops down, deposits her eggs, and soon they are driven away to the next county or across the country. Containing and eradicating the spotted lanternfly will require awareness, not just among the agriculture and entomology communities but also among homeowners, outdoorspeople, and others. The Pennsylvania Game Commission officer that called in the first report of this pest gave pest control authorities critical time to mobilize against the spotted lanternfly, and more keen eyes will be needed. Spotted lanternflies are generally easy to identify. Spichiger stresses that, if you spot a spotted lanternfly or any other unusual insect, always report it to your state’s department of agriculture or your local county extension office. Special thanks to Leigh Greenwood, outreach program manager, “Don’t Move Firewood” campaign, ‎The Nature Conservancy; Sven-Erik Spichiger, entomology program manager, Pennsylvania Department of Agriculture; and Julie Urban, Ph.D., senior research associate, Penn State Department of Entomology. So what is the relationship between healthy soils and healthy water? How can you manage inputs and planting date for high economic corn yields? Which soils should respond to sulfur applications? What are some opportunities and considerations with subsurface placement of nutrients? 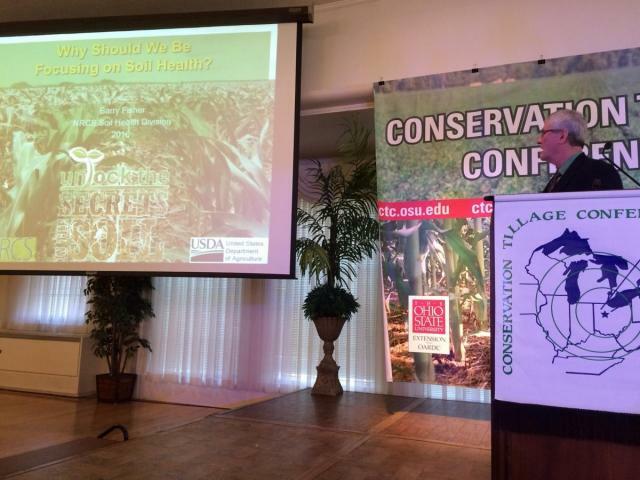 How can you build soil health and organic matter with cover crops and no-till? How can you use economics in the choice between growing corn and soybeans? What will the revised P index look like? How can you get started in honey bees, barley, or hops production? 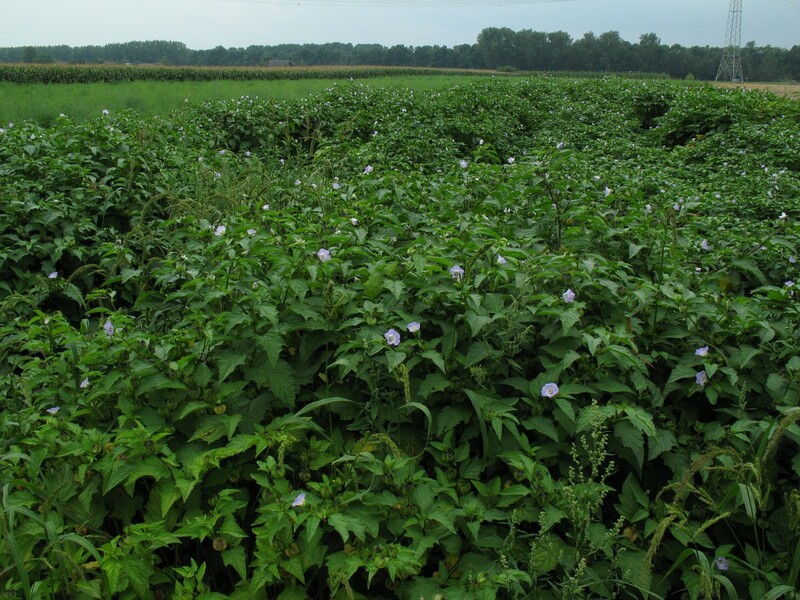 What are some methods to manage invasive plants around the farm? These are all questions you might have asked yourself, but have struggled to find an answer. 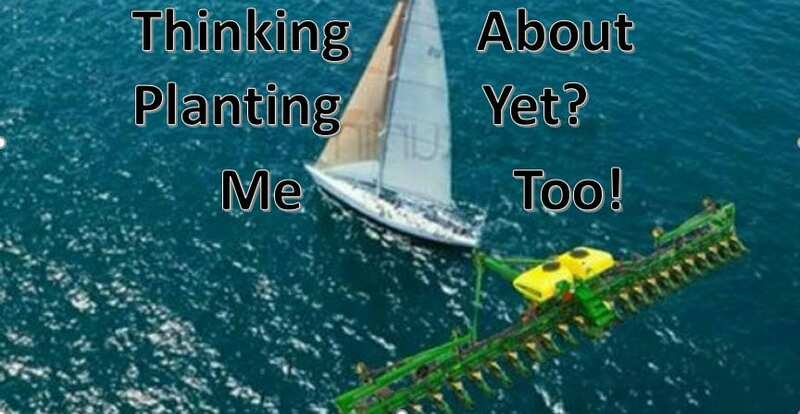 This year’s Conservation Tillage Conference (CTC) has the answers to these questions and many more. The McIntosh Center at Ohio Northern University will once again be the location were about 60 presenters, several agribusiness exhibitors, and approximately 900 participants will come together March 6th and 7th in Ada, Ohio. Attend this year’s conference to add value to your operation by learning new ideas and technologies to expand your agronomic crops knowledge. A general session with well-known author David Montgomery from the University of Washington discussing “From Dirt to Regenerating our Soils” will officially open this year’s conference. Corn University, Nutrient Management, Precision Ag & Digital Technologies, Healthy Soils for Healthy Water, Regenerative Ag, and Healthy Foods from Healthy Soils are the sessions that make up day one. On the second day, conference participants will be able to choose from Soybean School, Water Quality Research and BMPs, Alternative Crops, Pest Management of the Atypical Pests: Slugs, voles and more, Healthy Soils for Healthy Waters Precision Nutrient Management, and Healthy Water. 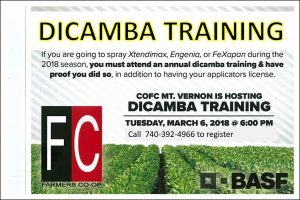 In addition, there will be an EPA required dicamba training on both days of this year’s Conservation Tillage Conference provided for pesticide applicators in attendance. 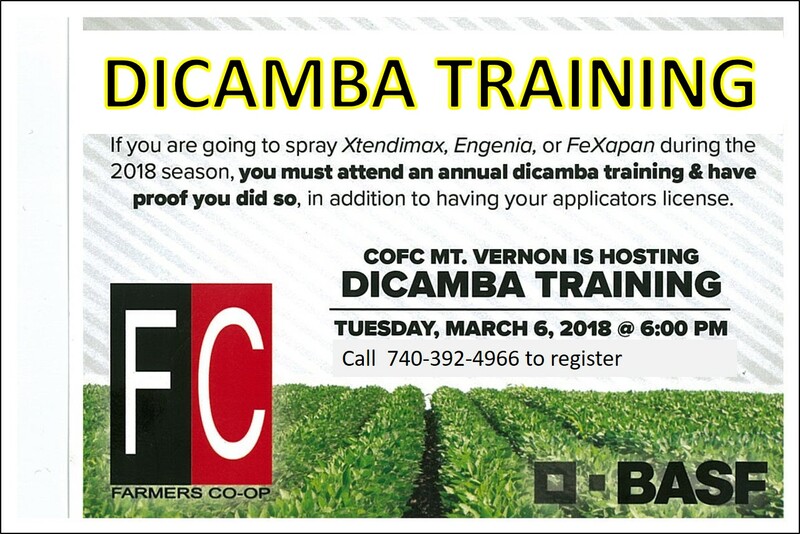 To register for one of these Monsanto-provided dicamba application requirements training events, go to: www.roundupreadyxtend.com/training. Find out what experts from OSU Extension, OARDC, USDA, and SWCD are learning from the latest research about the timely topics that affect today’s farmers, crop consultants, and agribusiness professionals who are out in the field working together to produce crops in an efficient and environmentally responsible manner. Certified Crop Adviser (CCA) and Certified Livestock Manager (CLM) credits will be available to those who attend. Visit ctc.osu.edu and make plans to participate in this year’s Conservation Tillage Conference by February 24 to take advantage of early registration rates.